Dorado y rojo. Usado, gastado.
. Mao Zedong. X1 B18. East China. want more than one stamp. one stamp only. ! item condition as seen shown. specific item details. Highly Collectable. ! cachet rouge "Airbus A380 Air France - Vol commémoratif AF 111 Shanghai-Paris / 50e anniversaire des Relations diplomatiques Chine-France / DE GAULLE & MAO TSE-TOUNG" (Chine) 27.1.2014. Qualité Neuf sans trace de charnière. See scans front & back. Little gum wrinkling one stamp. 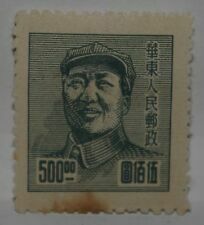 Sello de la República Popular China de 1967 Serie"Larga vida a Mao"
(with stain in the back). Date of issue:October 1,1967. Engraving and photogravure for value:2-11-13-14. Printing process. CHINE BLOC N° 67. NEUF SANS CHARNIERE. N’oubliez pas de m’ajouter à votreliste de favoris ! D on't forget to lets share a positive. A Global Classics & Rarities Sale. Wonderful Opportunities from Specialist Collections. This is a funny thing. An envelope featuring Mao Tse Dong with the Panchen Lama. So. it is as it is. a Mao FDC from 1993 with no stamp and no cancellation. Important for stamp collectors! I don't know if this FDC was ever issued properly (with stamp and cancel) or if the idea was abandoned. (Dieser Region bzw. formatige Karte;siehe auch FOTO/SCAN. leicht bestossene Ecken-Kanten, leichte Beschmutzung /3= Mängel wie deutliche Knicke o. Flecken, Beschädigungen);. Multicolor, usado. Emitido el 1 de octubre de 1967. Vedere scansione. XF MAI A BATTENTE. SERIE COURANTE "LA REVOLUTION CULTURELLE". BLOC TIMBRE. Mao Saludando. En buen estado. Serial number: W7 (14-10). Size stamp:31 52mm. See all photos (microscope X100). Date of issue: 1967-11-1. Poemas de Mao, emitido el 1 de octubre de 1967. Catalogue : SGMS3878. Issue : Birth Centenary of Mao Tse-tung min sheet. 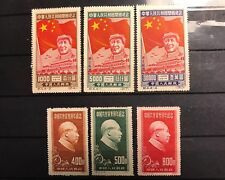 Condition : mint,never-hinged(MNH). Date : 1993. China No. : J.129. Stanley Gibbons No. : 3457-3458. No Exclusions. Condition: Mint Never Hinged. Date of issue: 04 July 1986. Scott No: 967. Date of issue: October 1, 1967. Printing process: photogravure. Scott No. : 2480a. China No. : PJZ-9. No Exclusions. Date of issue: 09 April 1999.